Moremi Game Reserve was proclaimed in 1963, and incorporates a large proportion of the Okavango Delta. The idea to create a reserve in the Okavango region came from Robert Kay (a crocodile-hunter turned conservationist) and his wife June (a writer). Yet it was the local BaTawana people (with help from the San/BaSarwa) who spearheaded the project, most notably Mohumagadi Pulane Moremi, the wife of deceased Chief Moremi II and the BaTawana’s Queen Regent. The reserve was named after the BaTawana Royal title, “Moremi”. Moremi Game Reserve is 5,000km2 and made up of floodplains, woodlands, thick forests, savanna grasslands and myriad waterways surrounding thousands of islands. The smaller islands were formed through a process of termite bioengineering while larger ones, like the famous Chief’s Island, are an effect of wrinkled fault lines deep below the Kalahari. Nighttime in the Okavango Delta is characterized by deeply evocative sounds: the bell-like “pings” of painted reed frogs, the hum of cicada beetles, the explosive grunts of hippos, and the deep roars of lions making you grateful to be tucked up safely in bed! The most popular time to visit the Delta is in winter when large herds of animals congregate around flooded marshes and rivers. 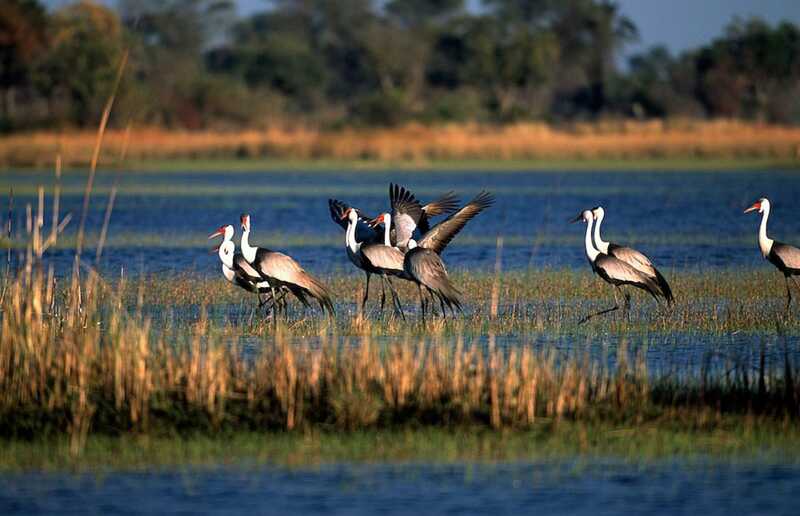 In Moremi Game Reserve you are driving on the mainland (primarily through mopane and acacia woodland with patches of open savanna), so your experience of the Okavango is limited to seasonally inundated plains of water and the outskirts of papyrus-fringed lagoons. These are fantastic game viewing areas and there are several great camping sites and lodges within the park (and also on nearby community concessions like Khwai) from which to explore. When the floodwaters recede and the first rains arrive in November/ December, wildlife disperses, especially breeding herds of elephant that move into the mopane forests where natural water holes fill up with rain. Summertime brings its own unique allure, turning the russet veld a vibrant green to be gorged upon by grazers like zebra, wildebeest and impala antelopes. This is the height of baby season and the plains abound with newborn plains game, tottering alongside their parents on unsteady legs. This makes for beautiful photo opportunities, and plenty of easy prey for wild dog packs and leopards. It may be more challenging to spot predators in the newly sprouted grass, but the spectacular display of migrant bird species is enough to inspire any nature lover, filling the air with brilliant trills and hues. To experience the Okavango’s innermost secrets, however, a traveller needs to visit one of the remote island camps tucked away in the water-rich inner regions of the Delta, only accessed by light aircraft.